Originally narrated by Rod Serling and later hosted by Nimoy from 1977 to 1982 (and briefly hosted by The X-Files‘ Mitch Pileggi in 2002), the rebooted TV series, In Search of, starring Quinto, looks at mysterious phenomena and explores the unexplained. The pilot, “Aliens,” feels right at home, airing on History Channel after Ancient Aliens. 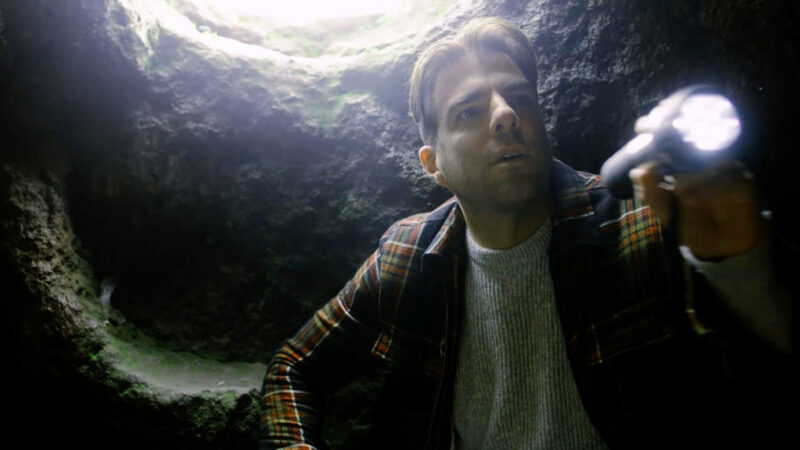 This first episode jumps directly into the storyline, without much of an introduction to the series or to Quinto’s overall hopes for the show. He’s more of an investigator/narrator than a host in this docuseries, hoping to uncover the truth behind the unknown. Quinto searches for extra-terrestrial life with the GBT (Green Bank Telescope, also known as the Great Big Thing): At 16 million pounds, with a reflector that’s 2.3 acres wide (which could fit two football stadiums inside it), it’s the largest radio telescope in the world. With the U.S. government proving real-life X-Files cases have actually taken place, it was interesting to see scientists investigate items that allegedly arrived from another planet. Unfortunately, the episode felt like it was simply trying to disprove the possibility of life from outside our planet. I really enjoyed the third episode, “Monsters of the Deep,” which explored unusual real-life sea creatures. Appearing in the episode were a scientist, a biologist and a cryptozoologist, who all discuss underwater predators, along with the unknown that might lie beneath the surface. The DNA test results of a newly discovered fish were shown and ocean-swimming, flesh-eating amphipods were discussed, although the crew could not recreate the viscious attacks allotted to these generally unseen creatures. “Artificial Intelligence” explored the advanced technology that allows robots to communicate and instantly teach other machines how to perform multiple tasks, as well as drone technology of the future and robots with a hive mentality. The best part was seeing a battle royal among the a.i. as if it was an episode of BattleBots. This episode was much more dry and less interesting than the previous ones. In fact, I totally skipped the second episode all together, as I was uninterested in tales of superhuman events. With hit-or-miss featured topics, Quinto doesn’t really bring much interest to the table to overcome the slower segments. Documentary series like this feel like they used to air more often back in the dark days before the World Wide Web and now feel somewhat antiquated, although still important in the grand scheme of information and entertainment. Shows like Unsolved Mysteries, Sightings and even Ripley’s Believe It Or Not all offered interesting infotainment just a little more unusual that the other. With some time, perhaps this version of In Search of will eventually find its footing and eventually it’ll stand uniquely tall.